Over the last few years more and more smaller companies have taken the venture to join the steadily growing market for boardgames, and today let us have a look at a promising game from one of these newcomers. 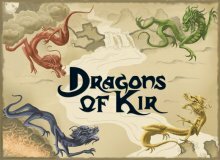 Located in the USA, 1iPRODUCTIONS has brought us the new two-player game Dragons of Kir which is settled in mystical Kir and tells the story of two warlords which want to take control of four ancient Dragons in order to destroy their opponents. The gameboard shows a square-sized gridwork of spaces, and it should be noted at this early point that the map, depicting the world of Kir, is considered to be endless. Thus, a figure leaving the map on one side will re-enter the board on the corresponding space on the opposing side. To set the game up, the figures of the four Dragons are placed on marked spaces close to the center of the gameboard, and each of the players then places his War Tent (Headquarters) at one of the two opposing corners of the board. In later games, this fixed setup may be partly changed since the player may be allowed to place their Tents wherever they choose, thus allowing for more flexibility and a bit of strategy before the game starts. 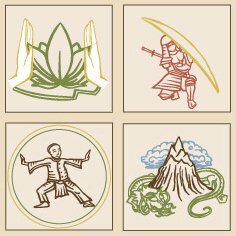 The four Dragons are the only figures on the gameboard which will move during the curse of the game, but it will be the players who influence the Dragons' movement by placing different kinds of action tiles onto the board. So, at the beginning of the game a deck comprising 56 tiles (four of each of the fourteen different kinds) will be shuffled, and each player is randomly assigned a starting hand of four tiles which he keeps hidden from his opponent. During a round of play, both players chose one of their tiles and place it onto an empty space of the gameboard. After both players have placed their tiles, each of the four Dragons will be moved forwards one space, and if one of the Dragons should arrive at a space occupied by a player's War Tent this player will lose the game because his Headquarters is destroyed. However, it is a tricky challenge for the players to use the action tiles in order to influence the Dragons' movement in a way to get to the other player's War Tent. Three different types of action tiles exist in the game: Impact tiles, Proximity tiles and Dragon tiles. An Impact tile is activated if a Dragon moves onto the space occupied by the tile, and the different types of impact tiles usually will cause the Dragon's movement to be deflected to a different target space. So, the Monk or the Samurai tiles will turn an approaching Dragon either by 90 or 180 degrees, whereas the River impact tile will push the Dragon downstream to emerge on the "outlet" side of the tiles. However, not all Impact tiles are approachable from all sides, and if a Dragon should move onto the tile from one of its unapproachable sides the tile will be destroyed and removed from the board. Unlike the Impact tiles, the Proximity tiles only require a Dragon to move onto a space within the sphere of influence of the tile in question. So, a fire can be seen from neighbouring spaces and wards a Dragon off to a different adjacent space, whereas the Wind or Storm will blow a Dragon one space further away. The Lotus pond on the other hand will attract a Dragon within its sphere of influence, so that a Dragon will move an additional step towards it. Comparable to Impact tiles, Proximity tiles are destroyed and removed when a Dragon moves onto their space. 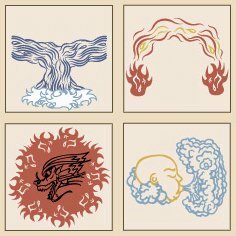 The final kind of tiles are the Dragon tiles, and the players use these tiles to place them directly on top of a Dragon. They will be active for only one round, but they may be used either to destroy all tiles on neighbouring spaces by Dragon Fire or to let the Dragon rest for one round at the Dragon's Lair. The rules offer some good, easy to understand examples for the solution of tile conflicts, and since only three different basic types of tiles exist these conflicts can be solved in a quite satisfactory fashion without the players falling into deep discussions whether a move should be allowed or not. Some minor rules issues seemingly remained open when playing the game for the first time, but everything that remained was solved quickly by resorting to the FAQ at the publisher's website. However, players will quickly discover that the seemingly fast gameplay looses quite a bit of its pace in accordance to the number of tiles which were placed on the gameboard. While it remains true that a player's turn requires not much action but just the placement of one tile, a higher amount of playing time each turn will be consumed when a considerable number of tiles is in use on the board. The players have to keep a constant watch on the proposed movement routes of the Dragons, since otherwise a somewhat nasty surprise might lead to a quick ending. This factor strongly reminded me of classic Chess, although Dragons of Kir is quite different in terms of movement and figures. And - in comparison to Chess - the effect is even stronger because players have to watch their backs against four Dragons which may even leave the gameboard and re-enter it on the opposite side. One other game also needs to be considered when talking about comparisons, and this is Finstere Flure by Friedemann Friese. In this game Frankenstein's monster moves through a Dungeon while the players try to escape with their figures, and the movement of the Monster also is influenced by features of the Dungeon and the relative positioning of the other figures. However, while Finstere Flure is somewhat more of a "party-game" which will be enjoyed best for its somewhat unpredictable results by a bigger number of players, Dragons of Kir will appeal more to strategists because of the much more palpable potential for planning. 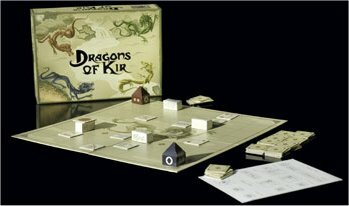 Also, Dragons of Kir is a perfect game for two players, and coupled with its functory but fitting artwork it certainly offers more attraction than many of the old, pure strategy games without a background or graphics.